Forklifts are designed to handle and transport both raw materials and goods safely and efficiently. From time to time these machines must be transported from one work site to another. An average sit-down forklift with the capacity to lift 5,000 pounds will itself weigh as much as 9,000 pounds. The average automobile weighs approximately 4,000 pounds. Weighing in at more than two times the weight of the average family automobile, forklifts require some special consideration and accommodations when being transported. Secure the transport vehicle at the loading dock. Whether you are using a flatbed or a tractor-trailer rig, you will need to make certain the wheels of the vehicle are chocked. If loading a trailer without the tractor attached you will need to put a nose jack under the front of the trailer. Adjust the nose jack so it is within one inch of contacting the trailer. This will prevent the trailer from forward tipping when loading the forklift. Drive the forklift onto/into the truck/trailer. The forklift will need to be backed onto/into the truck or trailer. 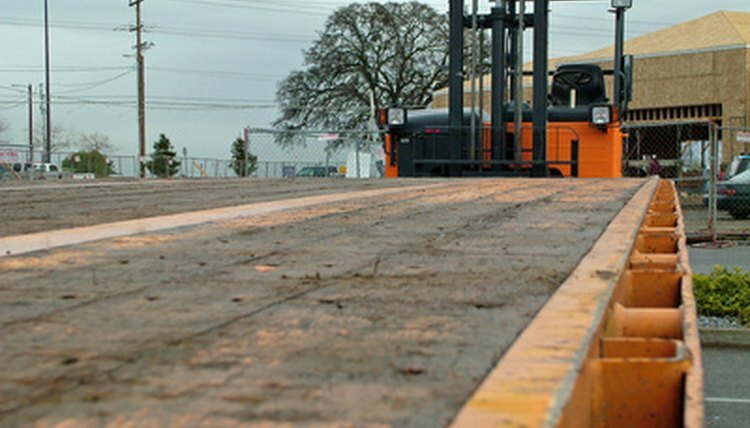 With the amount of weigh contained in the forklift, you always want the forks pointed toward the rear of the transport. If the forks are pointed forward and the transport has a collision the forks could be forced through the front of the transport resulting in a potentially hazardous situation. Center the forklift side to side in/on the transport. Lower the forks to the floor, tilting them forward slightly before impacting the transport floor. Place wood blocks behind each forklift wheel. Using the 4-inch screws, fasten the blocks in place by driving the screws through the block and into the wooden floor of the transport. These blocks need to be secure and held firmly against the forklift wheels. Shut off the fuel supply from the propane tank. If the unit is powered by gasoline or diesel, be certain the tank is secure and no fuel will be able to slosh or splash out during transport. Disconnect the battery terminal to help reduce the possibility of arcing. Secure the forklift to the flatbed truck using chains and come alongs. If using a flatbed truck or a low-loader with a tilting bed which allows the forklift to be loaded without the use of a loading dock, the forklift will need to be tied down. This should be done with heavy chains or nylon straps secured to the edges of the truck bed. Come alongs can be cracked down to tighten the chains to insure the forklift will not move. Two chains can be used to create four anchor points, one at each corner of the forklift. Raley, Tom. "How to Transport a Forklift." , https://careertrend.com/how-7174666-transport-forklift.html. 05 July 2017.